If you're interested in earning your Buffalo MBA, consider St. Bonaventure Online as your first choice. Our AACSB-accredited online MBA program can not only give you the credentials to boost your career, it will also give you the moral capacity to consistently make ethical business decisions that can better the world around you. 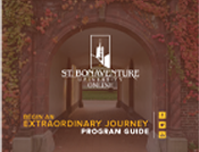 St. Bonaventure can help you get to where you want to be. St. Bonaventure actually has a campus located in Buffalo, but we encourage our potential students to take advantage of the distance learning opportunities we provide. The online Master of Business Administration program for Buffalo, NY residents uses a 7 week term format, with two terms in each semester. Most Buffalo residents can have the online degree requirements completed in approximately 2 years. Students with certain academic achievements may be able to have the online MBA requirements in as few as 20 months. Buffalo is a city in Western New York and is the second-most populated city in the state, surpassed only by New York City. It's proximity to Lake Erie proved very beneficial as Buffalo was able to become a leading part of the trading route to much of the Midwestern states. With the completion of the Erie Canal, Buffalo became incorporated in 1832. Interestingly, during the Civil War, Buffalo was known and the end of the Underground Railroad where escapade slaves and those looking for better freedom would make their way to Canada. Because of its strategic location, the city was known as more of an industrial city as its exports were steel and materials. Today, Buffalo has experienced a downturn due to industry, but has seen revitalization due to new businesses moving to the area as well as area school and colleges attracting students.